Hello and welcome to Ella May, the girl who likes to do things her way. 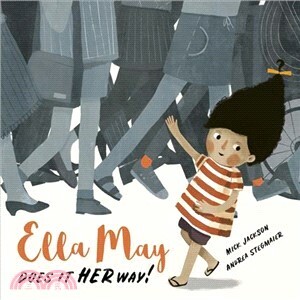 In the first of this brilliant new series all about an imaginative, strong-willed girl character with her own ideas, Ella May tries walking backward, just to see how it feels. In her bedroom she tries reading her books backward, and after dinner she goes backward up to the bathroom and climbs backward into bed. When Ella goes backward up the slide and backward over the castle, Ella’s mum decides to turn around and walk backward next to Ella, to make it easier for them to talk. Pretty soon, half the town is walking backward in a giant, backward-walking procession. Where will it end? Mick Jackson has published four adult novels and two collections of stories, all with Faber. His first novel, The Underground Man, was shortlisted for the Booker Prize and won the Royal Society of Authors First Novel Award. Mick came to children’s books late, through having his own kids. The children’s books he most admires are quite eccentric, but underpinned with tenderness. to university to study architecture, but that’s a different story. Andrea lives with her family in Stuttgart, a busy town in Germany.